With the recent agreement reached on July 13 between Iran and the major world powers re: their involvement in development of nuclear weapons, one wonders whether or not we have actually moved farther away or closer to the end of all things. Founded in 1945 by University of Chicago scientists who had helped develop the first atomic weapons in the Manhattan Project, the Bulletin of the Atomic Scientists created the Doomsday Clock two years later in June 1947, with “midnight” being symbolic of nuclear apocalypse, and the imagery of mankind “counting down” to zero (as if launching a missile) was to give an easily-understood snapshot of the threats to humanity and the planet at any given time. Since 1973, the decision to move forward or backward (or to leave in place) the minute hand of the Doomsday Clock is made every year by the Bulletin’s Science and Security Board, in consultation with its Board of Sponsors, which includes 17 Nobel laureates. The Clock has now become a universally-recognized indicator of the world’s vulnerability to catastrophe from nuclear weapons and new technologies emerging in other domains. 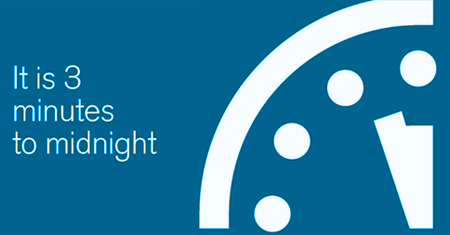 The Doomsday Clock was first set at 7 minutes to midnight simply because it looked good in the initial drawing of it. Since then, the minute hand has moved 21 times, taking us within 2 minutes of annihilation in 1953, after the United States and the Soviet Union each tested their first thermonuclear weapons within six months of one another. 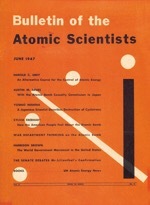 In 1991, with the end of the Cold War, the United States and the Soviet Union signed the Strategic Arms Reduction Treaty, the first treaty to provide for deep cuts to the two countries’ strategic nuclear weapons arsenals, prompting the Bulletin to set the clock hand to its farthest point – 17 minutes to midnight. The current negotiations with Iran highlight just how precarious the world can be with these weapons in the wrong hands. The justification for moving the clock forward, based on the current state of world in weapons of mass destruction is sound enough. Yet, the Looney Left once again has hijacked yet another prestigious scientific body to propagate the Climate Change Gospel. Remember, these are nuclear scientists, trained in fusion and fission – what possible training or by what scientific authority can they discuss turbulent weather patterns? Without scientific background, they speak from personal opinion – hardly the solid technical foundation needed to warrant suggesting a further move toward doomsday. They mention technologies affecting climate change – yet don’t address what exactly that means. After all, if this is about burning fossil fuels, they are about 50 years late to the table. It all starts to look like speculation and fear tactics. 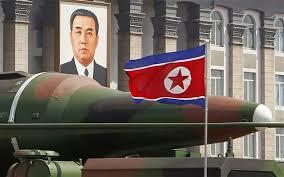 North Korean missiles on display during their May Day parade, 2015. The Bulletin could just as easily have positioned our current world instability at the exact same point simply by talking about Iran and North Korea’s interests in developing “the bomb”. In fact, according to the non-partisan, independent watch dog, the Arms Control Association (ACA), North Korea has already conducted 3 nuclear weapons tests. Were you aware of that? I sure wasn’t. They could have focused more attention on the fact that the United States has LOST 8 nuclear weapons since the 1950s – by lost, we undoubtedly mean “changed owners”. “at least eight nations have detonated 2,053 nuclear test explosions at dozens of test sites from Lop Nor in China, to the atolls of the Pacific, to Nevada, to Algeria where France conducted its first nuclear device, to western Australia where the U.K. exploded nuclear weapons, the South Atlantic, to Semipalatinsk in Kazakhstan, across Russia, and elsewhere“, according to the ACA? A large number of the early tests– 528 — were detonated in the atmosphere, which spread radioactive materials through the atmosphere. Many underground nuclear blasts have also vented radioactive material into the atmosphere and left radioactive contamination in the soil. Wow, any chance that could have contributed a bit to climate change or weather pattern disruptions? As of mid-2014, the authors estimate that there are approximately 16,300 nuclear weapons located at some 98 sites in 14 countries. Roughly 10,000 of these weapons are in military arsenals; the remaining weapons are retired and awaiting dismantlement. Approximately 4,000 are operationally available, and some 1,800 are on high alert and ready for use on short notice. The largest concentrations of nuclear weapons reside in Russia and the United States, which possess 93 percent of the total global inventory. 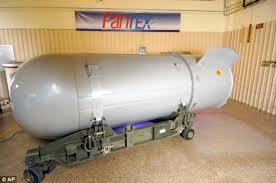 The B53 nuclear bomb, the largest and most powerful weapon in world history. With that bomb disassembled, what is the SECOND most powerful bomb in the world NOW? Or are there plans for something even more horrific just over the horizon? The mushroom cloud over Hiroshima, seen from 80 miles away, and more than an hour after the bomb detonated. At 8:15 AM on August 6, 1945, as the hazy sun dawned over the Japanese port city – the 7th largest city in Japan – the population awoke and began their day in a thousand ways . By this time most factory workers were on the job, kids were already on their way to school. There had been a separate fear of an air raid earlier that morning, which had been given the All Clear nearly an hour before – and no one expected a repeat performance. Remember, Hiroshima had not been attacked even once since the War had begun. So the people were out in the open, completely unprotected. Thousands of feet above, a single United States B-29 bomber slowly positioned itself over the city, having taken their air defences completely by surprise. When they were over their target zone, they simply opened the bomb bay doors, let this newly developed weapon drop out – and then made a 180 and returned to base, trying to stay ahead of what was to come next. Ironically named “Little Boy” (though it weighed over 8,000 lbs), the bomb fell for 44.4 seconds, after which both time and barometric triggers started the firing mechanism. The detonation took place at an altitude of approx. 1,968 feet, exactly as had been intended. Eyewitnesses on the ground reported that there followed a flash of heat and light, reported to be hotter than the surface of the sun, followed by a shockwave equivalent to up to 15,000 tons of TNT. Within seconds, 62.9% of the city’s 70,000 buildings, most made of wood, were totally destroyed – only 8% were undamaged. Remember, this detonation came from a mile above the streets of Hiroshima. How do you hide from that? 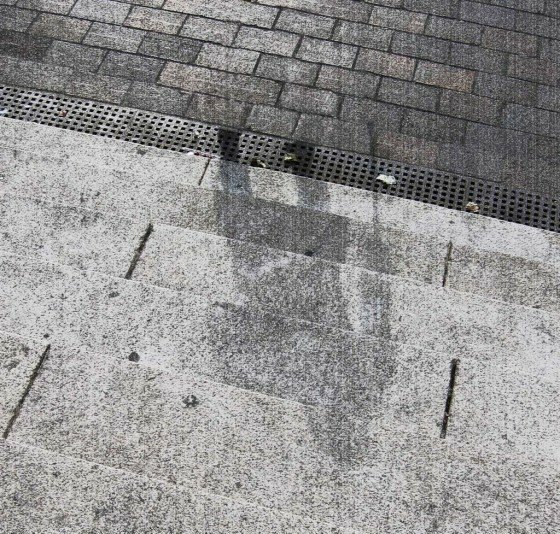 The shadows cast by people who literally vaporized or “carbonized” in Hiroshima, on August 6, 1945. You don’t – estimates are that 80,000 people were instantly “carbonized”. Meaning? They burned to a crisp. It is estimated that the surface ground temperature rose to 4,000°F in 3-4 seconds. Several stones on display at the Hiroshima museum seemed to show shadows of people that literally vaporized in seconds. Nearly 80,000 more died months later of exposure to radiation from this first atomic bomb, including over 20,000 soldiers of the Imperial Army. So devastating was the impact, the United States never released any footage of the bomb explosion or resulting after-effects on the city until 1951 – 6 years later. A member of the U.S. Strategic Bombing Survey, Lieutenant Daniel McGovern, used a film crew to document the results in early 1946, which resulted in a three-hour documentary entitled The Effects of the Atomic Bombs Against Hiroshima and Nagasaki. The documentary included images from hospitals showing the human effects of the bomb; it showed burned out buildings and cars, and rows of skulls and bones on the ground – and it was classified “secret” for the next 22 years. Kokura became the great miracle of World War II. 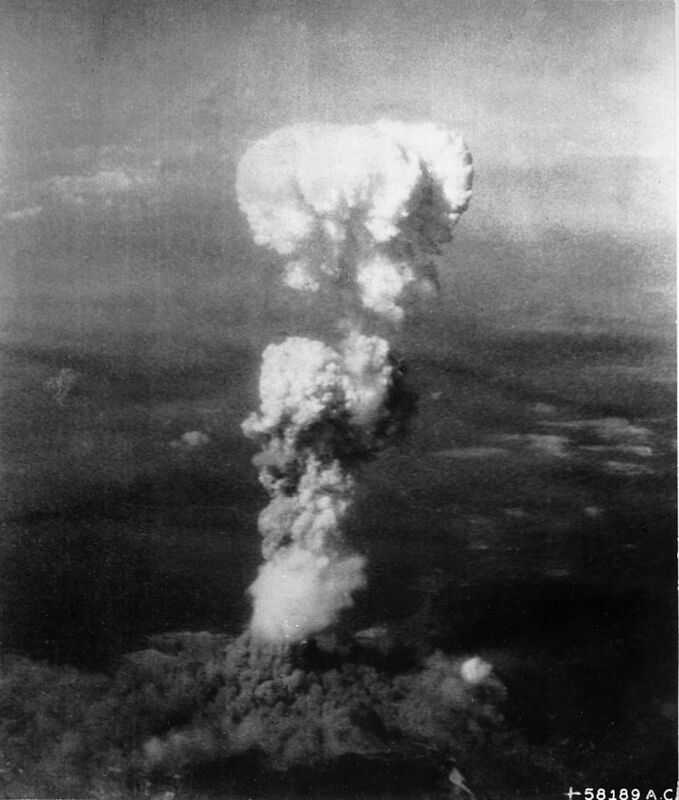 Not only was this city chosen as the backup should Hiroshima be clouded over, but on August 9 it was the primary target of the next bomb named “Fat Man” – but the smoke from a nearby bombed-out neighbouring city saved them again, and the nuclear blast that shook Nagasaki ended the Japanese involvement in World War II. His voice shaking with emotion, the Emperor announced the unconditional surrender of Japan – for most Japanese, it was the first time they had ever heard his voice. Today there are many other voices, some calm, some not so much, that are all moving us ever forward to what some think is the inevitability of the Apocalypse. I think the jury is still out – but until it is all said and done, and the fat lady (or another “Fat Man” bomb) sings, we can still write the next chapter in world history. Mankind must stand together, or be wasted by mutually assured destruction. Next PostIsrael’s Right To Might?